A story has it that Olomana was a giant and imposing warrior that ruled the area between Makapuʻu and Kualoa, in Windward Oʻahu. When Palila arrived at the top of the Nuʻuanu cliff he laid down his club and sped on till he reached Kaʻelepulu, the place where Olomana was standing. Palila slayed Olomana by cutting him in half. Part of Olomana became Mount Olomana; the other part of Olomana ended up on the far side of Kawainui as Mahinui, the ridge separating Kāneʻohe from Kawainui, where Kalaheo High School is located. Olomana (“forked hill”) is actually three peaks; the tallest peak, 1,643-feet high, is named after the legendary giant, Olomana. The second flat-topped peak is Pakuʻi at 1,520-feet named after the konohiki for the adjacent fishponds of Ka’elepulu (at what is now generally referred to as Enchanted Lake) and the third knife-edged peak is Ahiki at 1,480-feet (nearest Waimānalo) named after the warrior Olomana’s konohiki or overseer responsible for the wetlands of Kawainui. Olomana seems to be a favorite for hikers. They say it’s for intermediate to expert level hikers. The trail is approximately 2.5-miles long. The terrain is rugged with many areas only passable with the aid of ropes. From our house, we can see silhouettes of folks on Olomana’s peak. Likewise, we regularly see helicopters hovering over the area, rescuing another of these hikers. 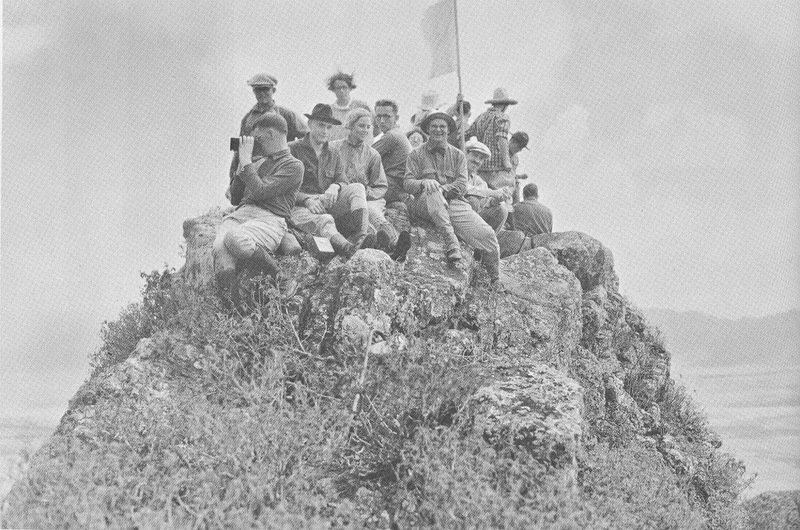 The image shows Olomana with hikers from the Trail and Mountain Club (Baker, Saga) in the early-1930s. In addition, I have added other images in a folder of like name in the Photos section on my Facebook and Google+ pages.